Between 80% and 91% of people in the analyzed professions were likely to have at least one hot streak. Earlier this year, the Tate Modern in London had its first-ever solo exhibition of the work of Pablo Picasso. What was unusual was that the Tate focused on a single year of Picasso’s life in great detail, with the work, across nine rooms, unfolding month-by-month in chronological order. Titled Picasso 1932, it explores a pivotal moment in the artist’s career. Having just turned 50, he was celebrated as a genius, living in chauffeured splendor in France, poised to break the record for a sale by a living artist (56,000 francs) and to hold the first retrospective in his lifetime in Zurich. But he also was living with an art world that questioned his relevance, carrying on an affair with the 22-year-old Marie-Thérèse Walter that was about to destroy his marriage, and coping with the slow breaking apart of his home country of Spain, where the ground was being laid for civil war. In this single year, Picasso created more than 100 paintings, drawings, and sculptures. They included three reclining nudes, supposedly inspired by Walter, that he painted in a span of 10 days at his country home in Normandy. One is owned by the Tate, another is owned by the Museum of Modern Art in New York, and the third is owned by hedge-fund manager Steven Cohen, who bought it for $155 million in 2013, a few years after the previous owner, casino mogul Steve Wynn, accidentally put his elbow through it. The three nudes were reunited for the first time in 85 years at this show. Picasso’s 1923 was later to be called his “year of wonders.” It meets the classic definition of a hot streak—a time in one’s life when everything clicks. Researchers from Penn State and Northwestern universities have described a hot streak as a “specific period during which an individual’s performance is substantially better than his or her typical performance” and also, more loosely, as “winning begets more winnings.” They set out to understand more about these periods and recently published their conclusions in Nature. 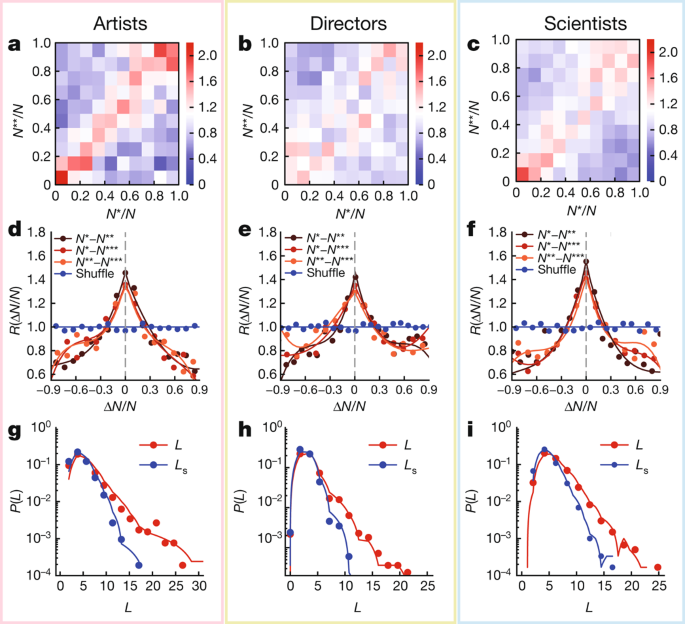 Lu Liu, Yang Wang, Roberta Sinatra, C. Lee Giles, Chaoming Song, and Dashun Wang analyzed the careers of more than 20,000 scientists, 3,000 artists, and 6,000 filmmakers, using public databases like box office, Google Scholar citations, and IMDB ratings as ways to objectively measure critical and commercial successes, and then running the data through statistical modeling. The data showed that between 80% and 91% of people in the analyzed professions were likely to have at least one hot streak in their career, as Fast Company reported. In around a third of cases, they had two hot streaks. More than two, however, was exceedingly rare. Hot streaks lasted just under four years for scientists and just over five years for artists and directors. The research provides further hope to people who feel they haven’t achieved something yet. Many think that our best work comes in our 30s and 40s. “But this turns out to be an incomplete reading of the data,” says Northwestern’s Wang in Fast Company.